All of our outdoor flags are finished with a strong, durable snow-white header and brass grommets. 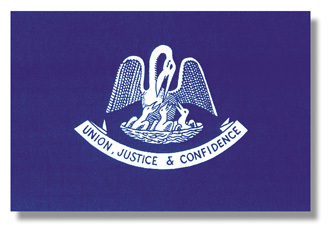 Unsurpassed in beauty and craftsmanship, our State Flags are manufactured to precise specifications. Authentic seals and designs are always in correct proportion to the flag size. Our dye process duplicates complex emblems with exacting accuracy in brilliant, fast colors. These flags are expertly crafted using 100% heavyweight 200-denier nylon bunting specially treated to resist sun and chemical deterioration. These flags are are extremely durable and fast drying. Recognized as the most durable of all flag fabrics, the Poly State Flags are skillfully crafted of 2-ply 100% polyester bunting. Its open weave construction reduces wind resistance, therefore lessoning abrasion and increasing flag life. Resists wear to wind, dirt and moisture and is ideal for industrial and institutional applications. Designed specifically for the needs of the most discriminating customer, this flag will prove to be the most durable, longest lasting flag available. These fully printed lightweight polyester are a popular choice where economy is essential. They fly in the slightest breeze and offer suberb color retention.